Ya Jagoff!!! | Get In The Fast Lane Grandma!!! Home Uncategorized Get In The Fast Lane Grandma!!! Get In The Fast Lane Grandma!!! We received two of these in the same week!! One on Facebook (pic above) and one Tweet. We can’t believe it has taken this long to catch someone doing this cuz it seems to happen CONSTANTLY!!!! Someone creating a line at the gas pumps for NO GOOD REASON! Example 1: Landscaper trailers that fill 25 gasoline containers during rush hour and then go inside to buy coffee and donut. 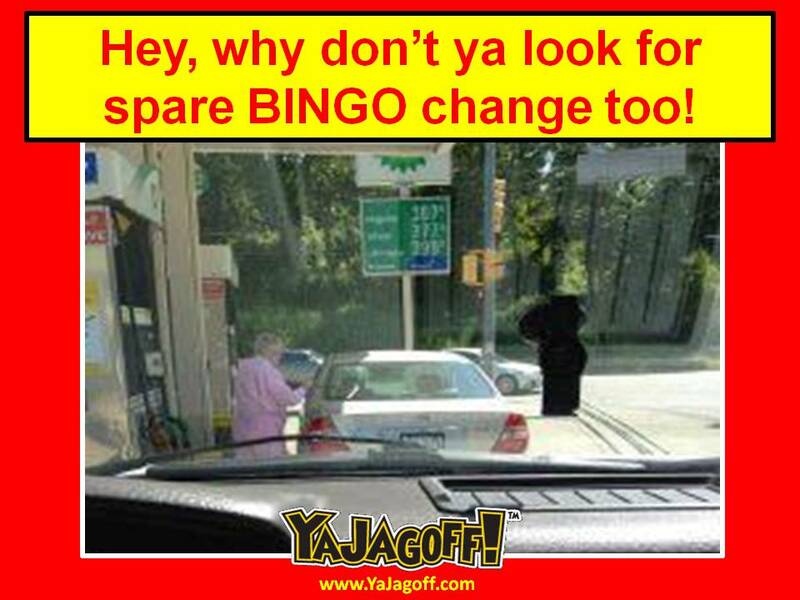 Now this is where it gets difficult….respect your elders or point out a Jagoff????????????? Oh boy! Because our Catholic School Guilt Training that we took in grade school will overwhelm us if we call someone’s grandma a…. well.. you know…we’re gonna do this. Hey (INSERT GASOLINE JAGOFF TYPE HERE) despite the fact that a tank of gas on most of the vehicles is just about the same price as a Penguins’ season ticket plan, the rest of us do need fuel. And we would like to get it sometime before our tank runs completely out while we are waiting in line. And, as in the case above with grandma detailing the “Sunday Rambler,” we would like to get gas SOMETIME before our automatic AARP Magazine subscription date! If you need to take a leak, take a peak, get a lottery card, pay cash cause you lost your debit card again, grab a Ding-Dong and a coffee or get the Instant-Laxative Hot Dog Special, MOVE YOUR CAR, the classic car cruise is at the plaza down the road on Friday night, Ya Jagoff!! Thanks to Twitter Follower @Stefanie5h and Facebook Follower Skip Brown for being today’s Honorary Jagoff Catchers!!! Next articleBecause It’s Tradition, That’s Why! Where Does The FedEx Arrow Point?